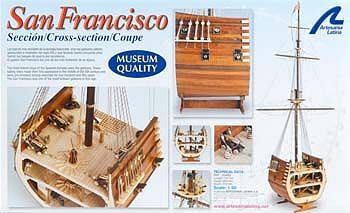 This is the Artesania Latina 1:50 scale Cross Section Model Kit of the San Francisco Spanish Galleon. All-wood construction with wooden stand. Brass hardware such as eyebolts, deck lights, rings, and more..
Three colors of thread, brown, tan and raw (pale green) for differen rigging applications. Painting is not required, but a good choice for enamel model paint i a large variety of colors would be the Humbrol line found unde vendor prefix ARXR..